Dr. Natalie Rouland is the Billington Fellow at the Woodrow Wilson Center in Washington, D.C. and the Fellow for the Study of Russia and Ballet at New York University’s Center for Ballet and the Arts and the Jordan Center for the Advanced Study of Russia. 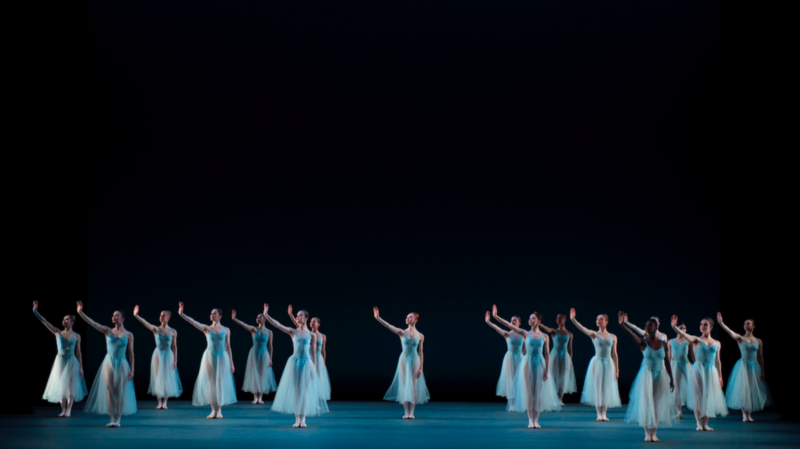 The Washington Ballet’s production of George Balanchine’s Serenade this past weekend at the Kennedy Center was a watershed moment for the company. Balanchine’s iconic 1934 ballet opened the Mixed Masters program that included Frederic Ashton’s 1946 Symphonic Variations and Jerome Robbins’s 1956 The Concert (Or, the Perils of Everybody). The program heralded the emergence of a Washington Ballet signature style: Russian lyricism tempered with English restraint and enlivened with American joie de vivre. Balanchine framed the Washington Ballet’s 2017-2018 season: Serenade closed the season that opened with Prodigal Son, the last work that Balanchine choreographed for Diaghilev’s Ballets Russes in 1929. Prodigal Son was featured in the Russian Masters program that included Fokine’s Les Sylphides, Petipa’s Le Corsaire, and Ratmansky’s Bolero. Ballet lovers will recognize these works as essential steps in the development of a dancer’s technique, sensibility, and stamina. Serenade superbly showcased those achievements. In conversation at the Saturday April 14 evening performance, Julie Kent observed, “You can see Balanchine is teaching his dancers how to dance.” For the past two years, Kent as Artistic Director and Victor Barbee as Associate Artistic Director have been doing for the Washington Ballet what Balanchine did for his nascent American ballet company. Kent and Barbee have been building the repertory of the company, providing their dancers with the vocabulary of the great ballets while testing them in the new, often risky works of emerging choreographers. On Saturday, Barbee gave credit to the dancers for their recent advances in technique and artistry: “the dancers did it themselves.” Their performances individually and as an ensemble testified to a refined style: graceful feet and hands, lengthened limbs, a light touch combined with a confidence in moving through space. While Serenade was conceived as an exercise to teach Balanchine’s students of the School of American Ballet how to move on stage, Symphonic Variations has been described as the ultimate introduction to Ashton’s meticulously-articulated movement. Both ballets are choreographic building blocks, canonic works beloved by audiences, and felt fresh and timeless in the interpretation of the Washington Ballet. Robbins’s The Concert on Saturday evening highlighted the comedic talent of rising star Brittany Stone, the company, and the pianist Glenn Sales. The iconoclastic romp set to Frédéric Chopin elicited much laughter from the audience and featured the hauntingly beautiful Raindrop Prelude. Yet to me the caricatured gender roles in Robbins’s dance landscape felt narrow after the expansive, neoclassical realms of Balanchine and Ashton. Ashton’s post-World War II work reflected the measured equity and English restraint of three women and three men in deceptively graceful, technically rigorous groupings (no one leaves the stage during the eighteen-minute piece). Notable performances included Venus Villa on Saturday afternoon and Brooklyn Mack and Eunwon Lee on Saturday evening, whose crisp precision perfectly punctuated César Franck’s music. Balanchine’s Serenade made the most emotional impact. Ballets Russes dancer Alexandra Danilova once described Tchaikovsky’s Serenade for Strings in C Major as “like a wave.” The blue tulle costumes of the dancers, the blue backdrop above a bare stage, and the round, now rushing, now suspended movements of the dancers reinforced the oceanic quality of Tchaikovsky’s music. The ballet’s signature moments were performed with meticulous attention to Tchaikovsky’s melody by the Washington Ballet: the corps de ballet’s pin-sharp pique turns in a circle, Esmiana Jani’s music-box rotation as the Dark Angel in arabesque, Eunwon Lee’s arched ascent upstage as the Waltz Girl held aloft by three male dancers. Complex patterns fragmented and reformed. Canons recurred over the course of the work. The Waltz Girl is marked from the beginning: she arrives late, attains elated heights in the Waltz pas de deux, falls to the floor in the Elegy, and achieves an ambiguous apotheosis at the ballet’s conclusion. Danilova believed this girl was modeled on her in her love triangle with Balanchine and his first wife Tamara Geva. The narrative meaning of Balanchine’s Serenade remains up for debate. Balanchine insisted his work was a simple exercise in stage movement conceived in collaboration with the dancers of his new ballet company. Literary scholar Elizabeth Kendall has suggested that the ballet reprised a tragic episode in Balanchine’s life, the mysterious death of friend and dancer Lidia Ivanova mere days before they planned to leave Leningrad together with Geva in the summer of 1924. Both Kendall and Homans point out that Balanchine used the same Tchaikovsky music as Fokine’s 1915 Eros, which featured Ivanova as a nymph in the Waltz movement. Ivanova’s untimely demise in a boating accident was clouded in suspicion due to her relationship with Soviet secret police, and must have traumatized Balanchine. Could Balanchine’s iconic watery work eulogize this young dancer of his Russian past? Could Ivanova be the biographical figure behind the Waltz Girl? Above all, Serenade remains a ballet about dancers and about the forces that animate, inspire, and transform them. In the Washington Ballet’s aspirations for excellence, Kent could choose no more fitting work than Balanchine’s Serenade, with its fusion of Russian nostalgia and American innovation. For those who missed Serenade in the Mixed Masters program from April 12 though April 15, Balanchine’s ballet will open the Washington Welcomes program from September 27 through September 30, 2018 at the Kennedy Center.